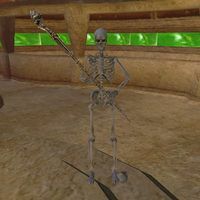 The Skeleton War-Wizard is a unique, high-level undead skeleton who resides at the top of the Velothi Tower Ald Redaynia. He holds the artifact Vampiric Ring and guards the Bittercup. He is a decent challenge as a foe. The Bitter Cup: Find the Bittercup artifact and persuade Eydis Fire-Eye to betray the Camonna Tong. While the Skeleton War-Wizard may appear to be a spellcaster, it cannot be stopped by Silence or Sound spells, nor will depleting its Magicka supply have any effect, since the spells it casts come from enchanted items, rather than being actual spells. This page was last modified on 19 December 2013, at 23:06.